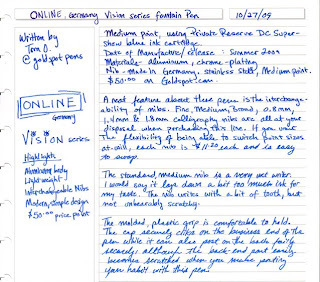 Released in Summer of 2009, the ONLINE Vision series is a sturdy, aluminum-based writing instrument that strikes a harmony between ergonomic utility and modern, elegant style. The lightweight characteristic of the aluminum body affords the writer hours of pain-free writing comfort while the molded plastic front section ensures a secure grip. A neat feature on this series of fountain pens is the interchangeable nib option. When you order most ONLINE pens on our website, you can make a special request to have the nib be swapped for a fine, medium, broad, 0.8mm calligraphy, 1.4mm calligraphy or 1.8mm calligraphy nib size. The nibs are also sold separately for a modest $11.20 per nib. Just search "online nibs" on our website store and you will find all available sizes. All of the ONLINE fountain pens are sold with medium as the default. So, that is why I decided to write with a medium for this review. As you will see in the first photo, the packaging is no-frills, much alike Lamy, who value utility over unnecessary elaboration. The black carboard box has a clear, plastic window and a magnetic closure. The pen arrives only with international-size ink cartridges aboard. For those who fuel with ink bottles, remember to buy a standard "Schmidt" converter with your order. 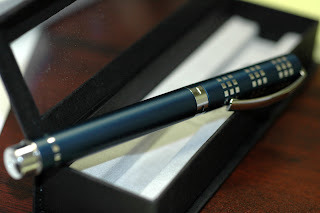 I loaded the pen with a Private Reserve DC Supershow Blue ink cartridge and wrote the review. My initial impressions on the nib were this : really wet and toothy. 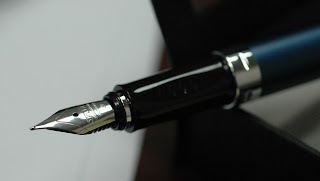 The toothiness does vary on how you angle the nib and your writing style. The ink flows very generously, even more than I would expect for a medium point. No skipping or starting issues. Overall, I would not rate it among the better of the stainless steel nibs, this one is just O.K. The cap has a very solid snap to the front end of the pen. It posts well to the chrome-plated back end of the pen, but the metal sheath inside of the cap will end up leaving scratches on the chrome after extended use. The clip is solid and feels like it is spring-loaded when you press the very top of the cap. As far as aesthetics are concerned, the Vision series uses a series of geometric patterns that are matched up with each color finish. The effect is very modern and sleek. The contrast of the matte color finish against the polished chrome appointments is a nice touch. At this price, the Vision is a "recession buster" in the fine-writing market right now. With brands like Waterman and Parker still cranking out pens north of $300 retail, it is good to see that some manufacturers understand the modern pen consumer. Great value for writers looking for a solid, dependable pen to use as a daily writer.